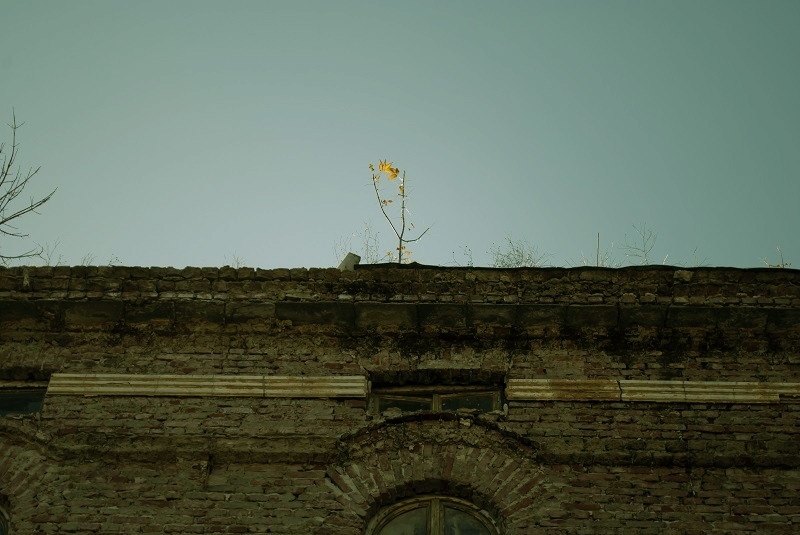 About the project "The Tobacco City"
The future of the tobacco houses with "Plovdiv 2019"
"The Tobacco City" is a project about the preservation of a vanishing city through multi-genre artistic actions, installations, exhibitions and research. 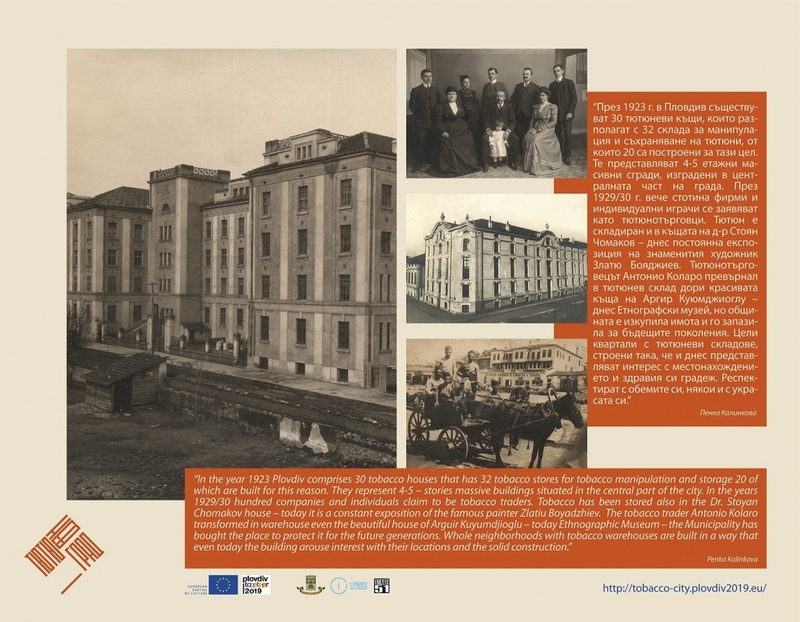 The Tobacco warehouses in Plovdiv preserve a special history and potential. 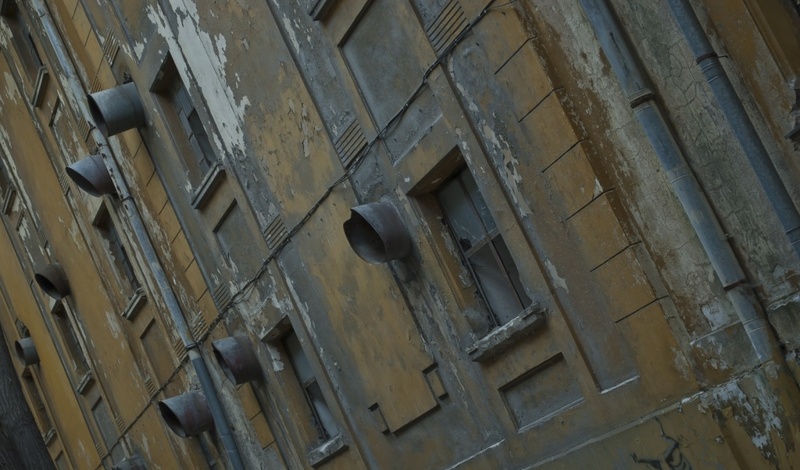 Although most of the warehouses are now abandoned, the buildings are not forgotten and the area still fascinates with its unique architecture. The opportunities which may arise from the partial preservation, restoration and transformation of the area into a cultural places are important to us and are implemented in the Bid Book of our city under the project "The Tobacco City". Artistic intervention in the public space. 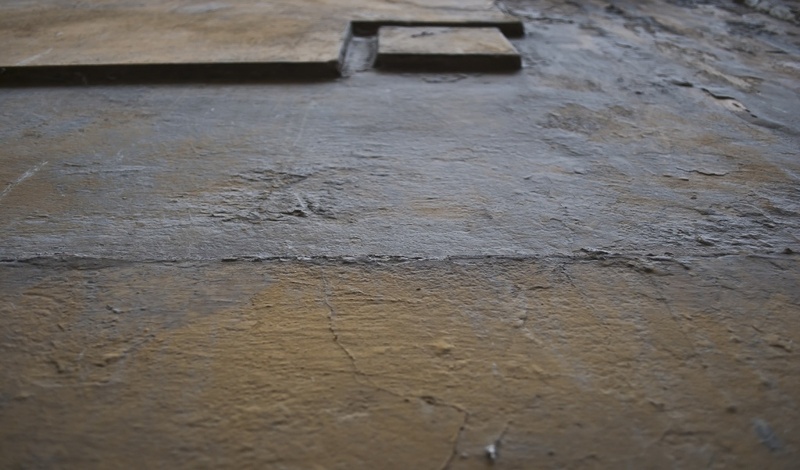 Through artistic intervention, the project cluster Urban Dreams aims to revitalise and open up dysfunctional spaces, buildings and objects as parts of a “parallel abandoned city”. These will be interventions on a local level but there is an undercurrent connected to the narrative of the transformation of public space in European cities. 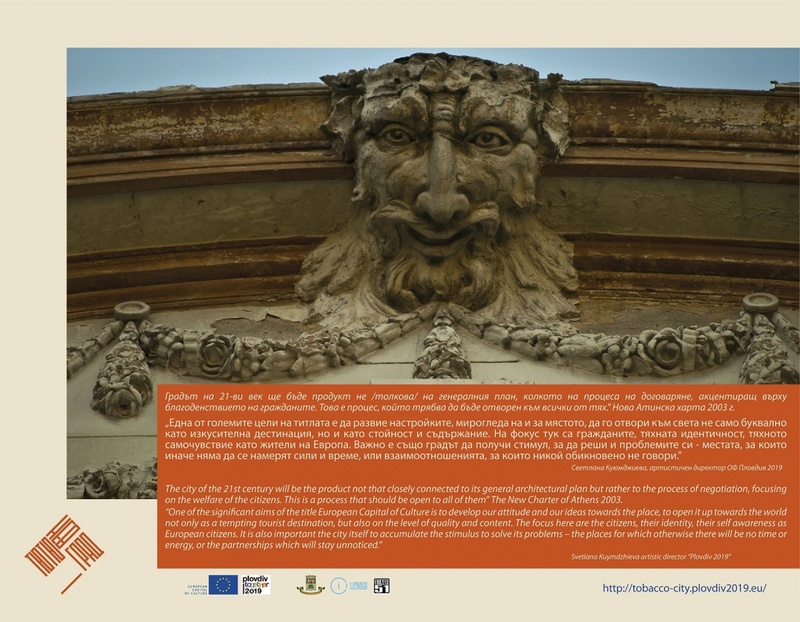 We will work with local and international partners and artists in order to exchange know-how and best practice as well as to open up a discussion on the European level about problematic architectural heritage in the contemporary context. Abandoned buildings from the recent past, some of them prominent architectural achievements (e.g. 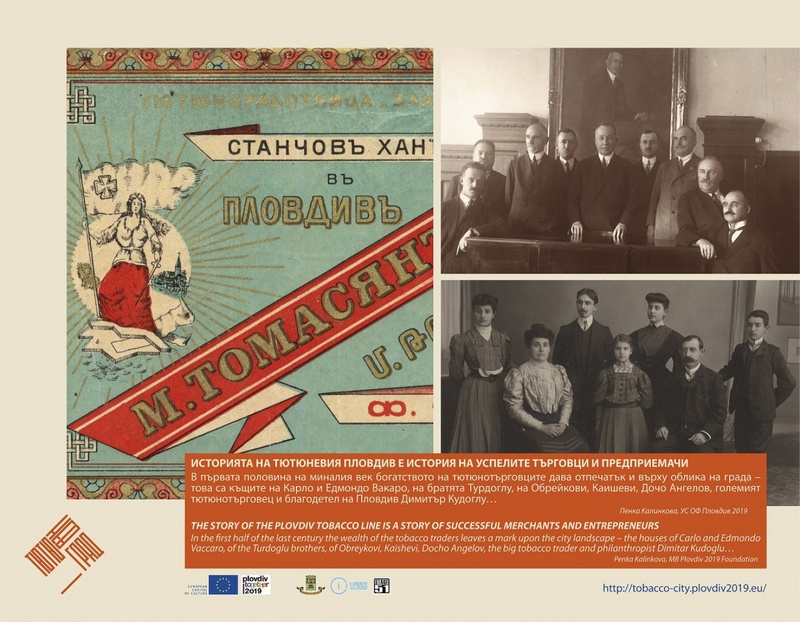 tobacco warehouses, Bratska Mogila monument, Kosmos Cinema, Kapana – The Trap neighbourhood) will become spaces for cultural activity and social interaction. We will build on the experience of the recent citizen’s campaign to save and re-cycle the Kosmos Cinema building – an example of how civic action can turn into a successful model for preserving cultural heritage. Our goal is to re-think and re-cycle new spaces for art and culture. 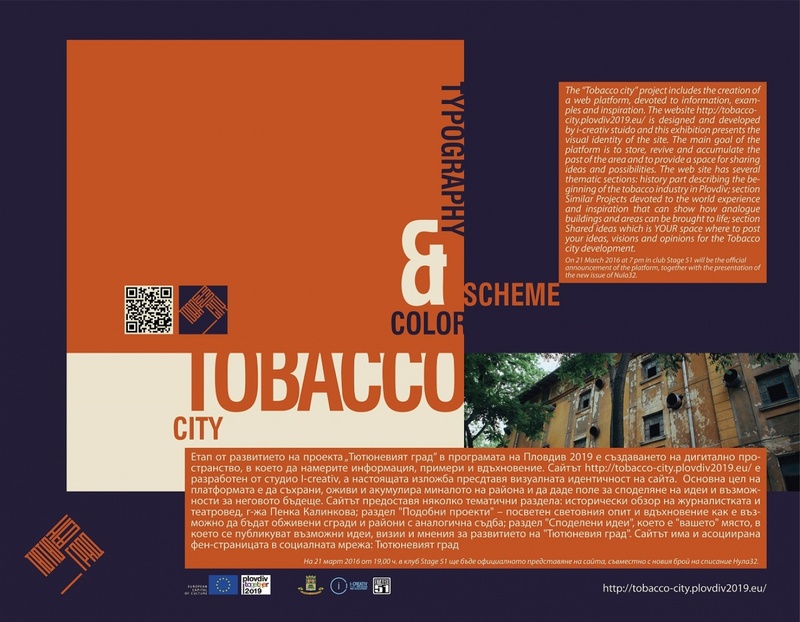 The project "The Tobacco City"
In the very heart of Plovdiv there is an area that fascinates with its faded beauty and smell of tobacco: the so-called Tobacco City. The unique tobacco warehouses from the 1920s, with few exceptions, are now abandoned, and many of them are in extremely bad condition. Some have been demolished and others restored to become luxury offices and residential buildings. Despite being acknowledged cultural-heritage monuments, they are privately owned, which is a major reason for their uncertain future. This is a common problem in most post- communist countries. 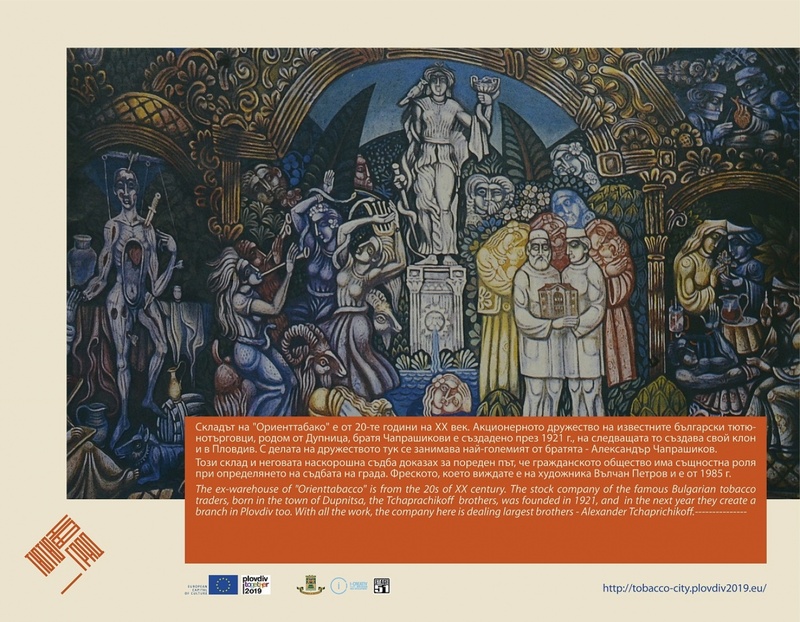 The project will be looking for artistic mechanisms not only to focus attention on this specific problem, but also to point out the clash between the architectural heritage and the economic interests of the city – a relevant topic in many European cities. Stand up for the Tobacco City! The first step towards re-thinking and preserving the warehouses will be to raise awareness amongst citizens. We have organised presentations, lectures and discussions about the history and architecture of the area. 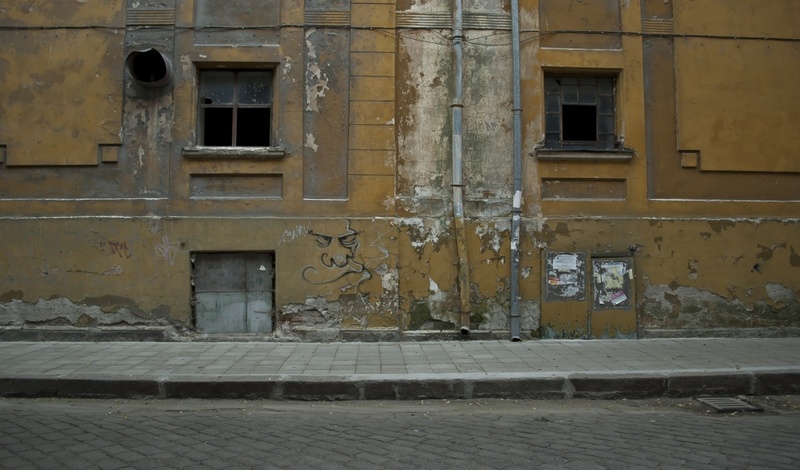 The first event took place in 2014 when the prominent Bulgarian writer and filmmaker Penka Kalinkova presented her documentary "The Vanishing City". Тhere was also a large-format archive exhibition of images in one of the renovated warehouses "Galero" to show how they looked like in the past. We also organised discussions about the future of the buildings. See all the events HERE. 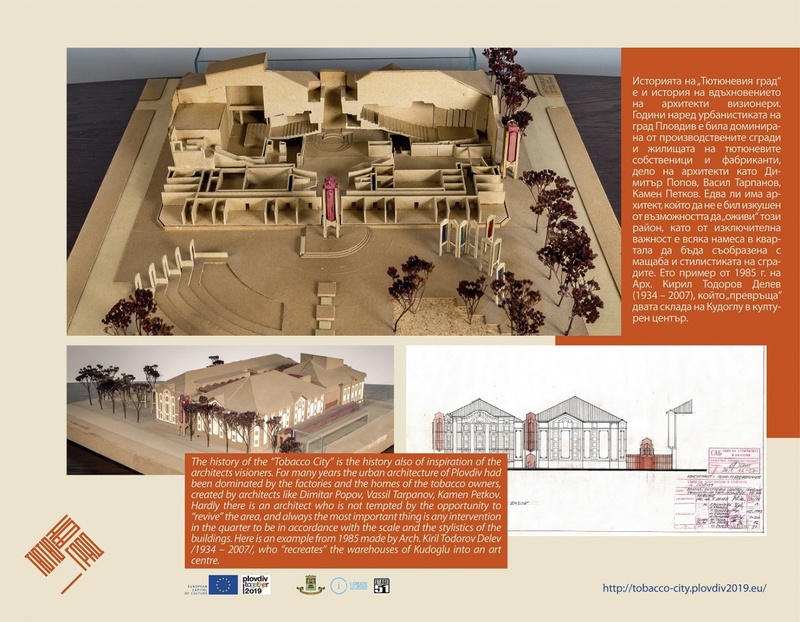 As a second step the bid book of Plvodiv had in mind to force the launching of a crowdfunding campaign collecting funds for buying at least one of the buildings and transforming it into a centre for culture and arts. 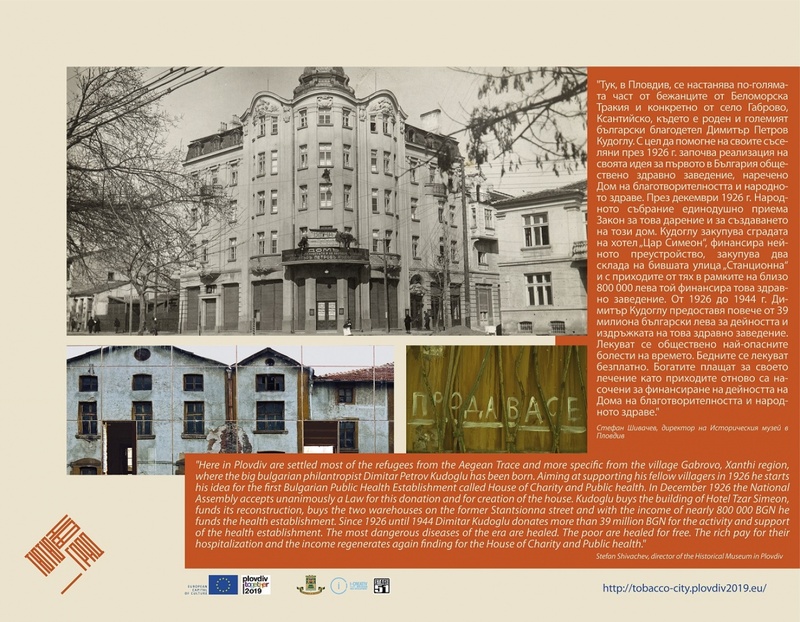 Alas, the crowdfunding in Bulgaria is still failing to generate such funds, but the Plovdiv 2019 Foundation made an alternative step forward - from 2018, the team of the European Capital of Culture Plovdiv 2019 moved its activities and set up one of the former warehouses in a zone for culture and art #SKLAD. We are aware that by 2019 some of the buildings might have undergone an “un-cultural” gentrification process. 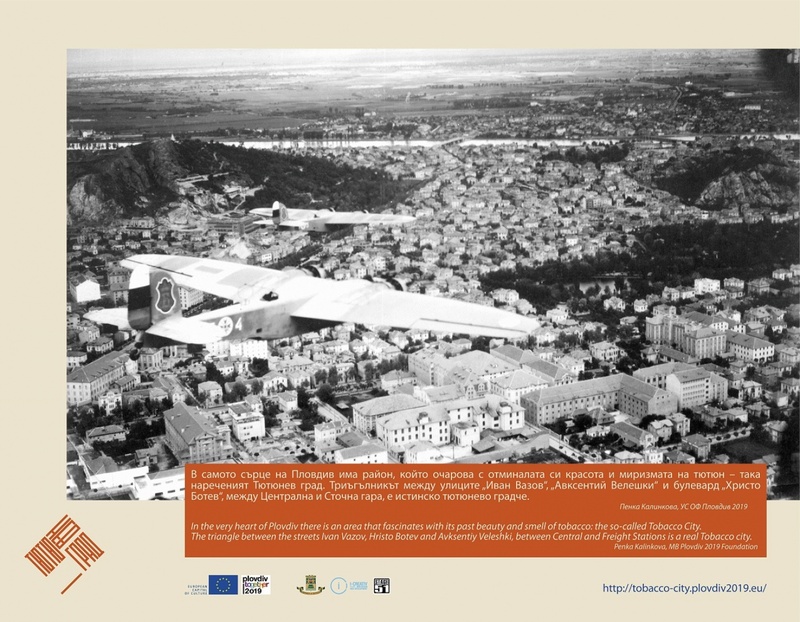 That's why we gave a platform for research projects along with historians, architects, urban planners and artists to create open-air exhibitions in different parts of the city to “bring the Tobacco City to the people”. Information and research materials are provided online in this interactive webpage where citizens can make a virtual walk, share personal stories, photos and ideas for the future of buildings. See shared ideas HERE and our events HERE. This project stems from the idea that windows are the eyes of the city. Each window in the Tobacco City to become a small stage or a canvas – for example, a musician to play on the first window, the second to be occupied by a light and sound installation, in the third there to be a theatre scene etc. 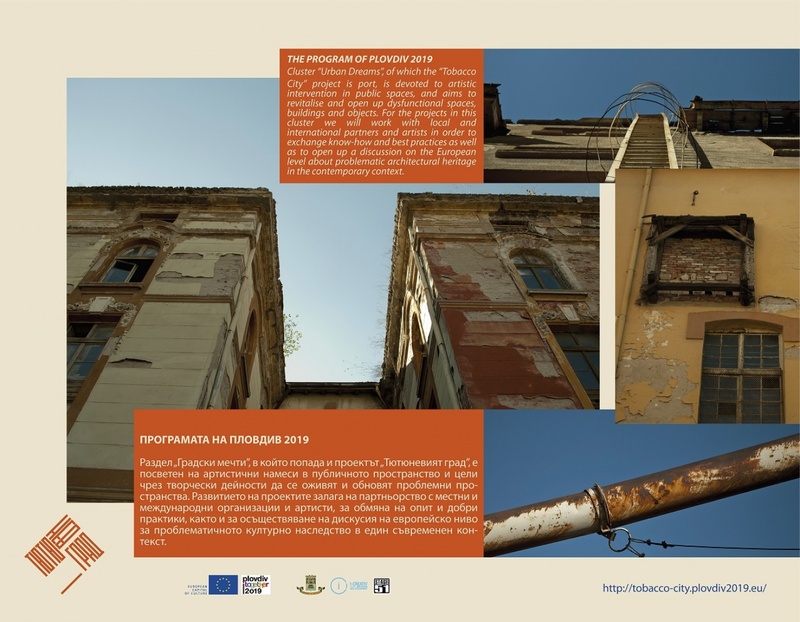 The project involves spontaneous artistic actions - an invitation for a meeting with owners, politicians, investors and citizens; building a model for restoration with architects, designers and citizens. These ideas took place and still are in the everyday life of the project theatre performances, concerts, flashmob events, festivals, and seminars are happening here. See our events. A temporary home for art projects (artists will apply with proposals to realise their short-term projects of three to six months - this was in the bid book). #SKLAD is making this real - transforming the interior, creating temporary installations, sculptures and gardens, preserving the authentic part of the tobacco-production spaces and converting the warehouses into interactive museums. 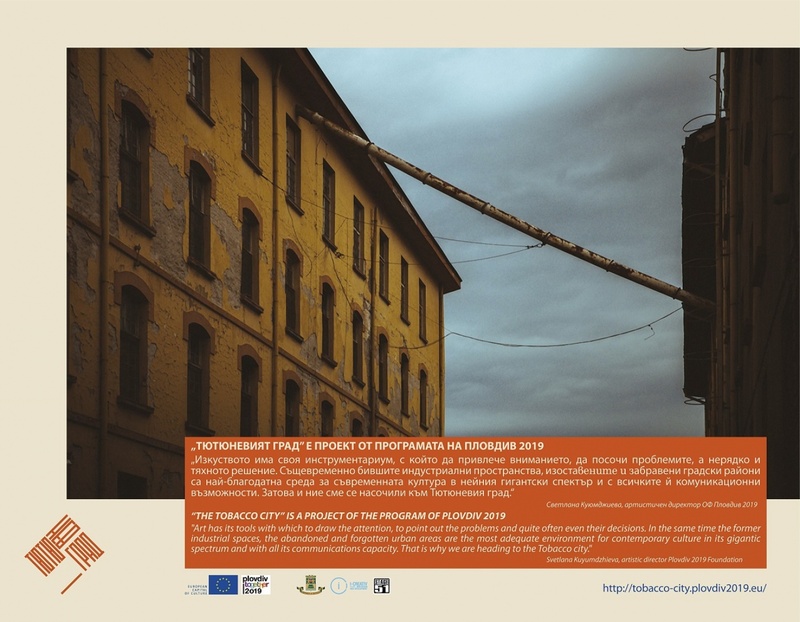 "The Tobacco City" is a project about the preservation of a vanishing tobacco-industry city through multi-genre artistic actions, installations, exhibitions and research, implemented by Plovdiv 2019 Foundation as part of the programme of European Capital of Culture2019.